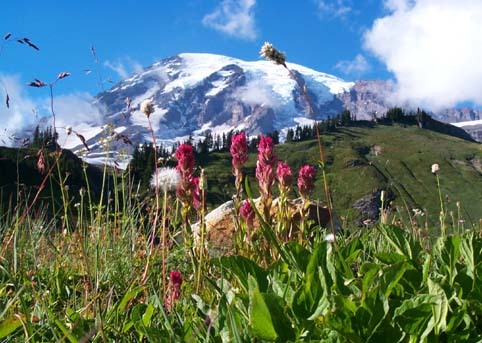 The meadows of Paradise are arguably the most popular summer hiking destination located within Mount Rainier National Park. 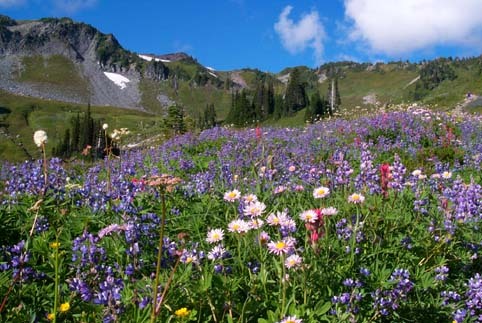 Late each summer, peaking around the second week in August, massive amounts of flowers burst into bloom across the spectacular meadows of Paradise. You will find many hiking trails in Paradise. Trails range from less than a quarter mile on a paved surface to the five mile dirt, gravel and snow, Skyline Trail which travels the circumference of the meadows. Common flowers that you will find are Indian Paintbrush, Daisies, Lupins, Beargrass and many many others. Paradise is located on the south face of Mt. Rainier. Follow Washington State route 706 to the Nisqually entrance. Continue east for 18 miles until you reach the Paradise Visitors Center.